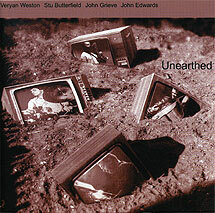 Veryan Weston, piano; John Grieve, tenor saxophone; John Edwards, double bass; Stu Butterfield, drums. Recorded live at the Vortex, Stoke Newington, London on 30 June 1998. Front cover montage (reproduced above) based on "TV Gardens", an installation in Reading in 1987 by John Grieve and montaged by Matt Taylor.